It is that time of the year again! The Great Dorset Beach Clean returns for another year of making our coastal areas and beaches look fresh, clean and ready to be used for summer! This year Poole Enviroteers are running two litter picks over the Great Dorset Beach Clean weekend, on the Saturday 27th April we will be based on Holes Bay opposite the new Sterte and Holes Bay Junction from 8:30am until 11am, with all the litter picking equipment you could ever ask for! On the Sunday 28th we will be partnering with Poole Heathlands to bring you a litter pick on Ham Common where ‘base camp’ will be set up by Lake Pier car park. All this information, and more, can be found on the Facebook event here. Make sure to share this with your friends and family, and we hope for beautiful weather as people walk up and down our coasts giving them a good ol’ clean! 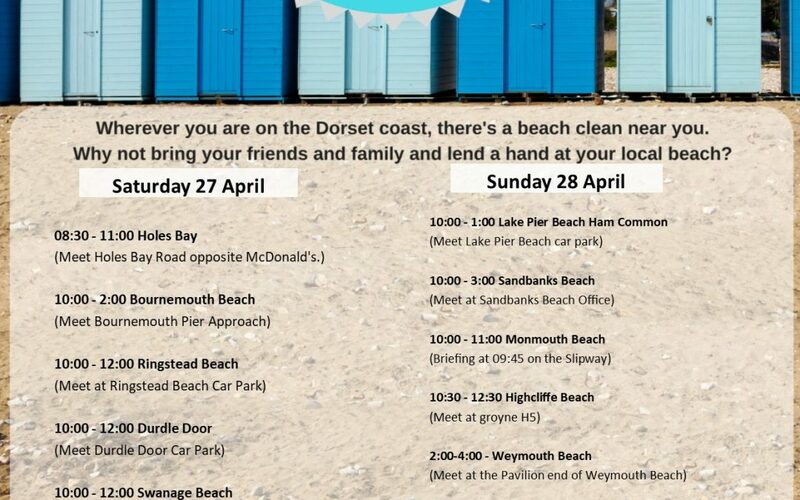 Alongside these events there are many other events occurring up and down the Dorset coast, and you can find out more about these further events on Litter Free Coast and Seas website. We will also have some delicious tea, coffee and biscuits available at our picks and we hope the sun will shine on both days and make this a great way to get outside, take action in your local environment and make a difference to our local area and the impacts it faces from litter.